ANTONINUS of SORRENTO, Abbot of the Abbey of St. Agrippinus. St. Antoninus is the Patron-Saint of Sorrento, and a church named in his honour at the site of the Abbey. CONRAN, (Date Unknown), little is known about St. Conran, other than that he was a Bishop of the Orkney Islands, known for his austere life and zealousness in the cure of souls. In the past he was held in great veneration in the North of Scotland. ELEUCHADIUS, (Second Century), after St. Apollinaris of Ravenna (23rd July), baptised him, he ordained St. Eleuchadius to the diaconate. In 100 St. Eleuchadius was selected to be Bishop of Ravenna after a dove alighted on his head, which the people took to be a sign from the Holy Spirit. NOSTRIANUS, the sixteenth Bishop of Naples, and an indefatigable foe of Arianism and Pelagianism. St. Nostrianus reposed circa 450. PROCULUS, EPHEBUS, APOLLONIUS, and VALENTINE (Martyrs of Terni), St. Valentine was consecrated Bishop of Terni circa 197 by Pope St. Victor I (28th July). SS. Proculus Ephebus, and Apollonius arranged for a proper burial for St. Valentine. All were martyred circa 273 during the Aurelian Persecutions. However, it is commonly accepted by contemporary scholars that St. Valentine of Terni and St. Valentine of Rome (vide infra) were the same person. THEODOSIUS, a mid-sixth century Bishop of Vaison, who was succeeded by St. Quinidius (15th February). St. Theodosius reposed in 554. VALENTINE of ROME, according to tradition, St. Valentine was a priest (possibly a bishop) and physician in Rome martyred circa 269. The legend is that St. Valentine, along with SS. 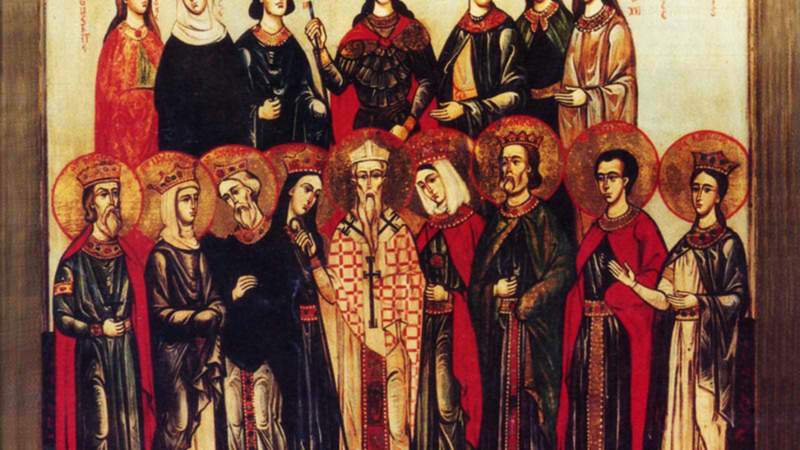 Marius, Martha, Audifax, and Abachum (19th January) provided spiritual as well as physical support to condemned martyrs, and organised proper burial for them. However, the opinion of contemporary scholars is that it is almost certain that St. Valentine of Rome and St. Valentine of Terni (vide supra) were the same person. VITALIS, FELICULA, and ZENO, (Date Unknown), three martyrs, most likely Roman, of whom nothing is known.